When a desperate 10am phone call found her house quiet and happily crafting these dolls, it didn't take long for me to hop off the phone and onto Kiddley to claim some of our own crafty family mojo. In just a few minutes, with some glue and ribbon and fabric, the day was saved. Ah. 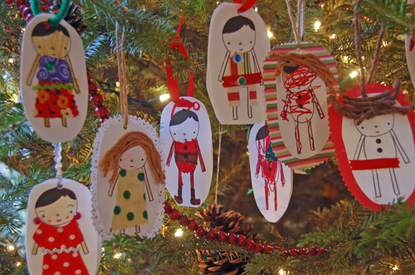 These are the Dress Up Ornaments by Sarah of The Small Object. It kept everyone in my house busy working away for hours (And perfectly fitting for my babes - Calvin's responsible for the glam, and Ezra's responsible for the tactile fab hair). Have you been over to Kiddley as much as I have lately? They're totally rocking my world this month with all the fab holiday crafting ideas. Next up, we're doing Fiona's Paper Garlands!